In the framework of the EU-funded project “Improving the provision of Social Service Delivery in South Eastern Europe through the empowerment of national and regional CSOs”, IRIS Network in cooperation with Solidar has selected the candidate for participation in four weeks long Professional Staff Traineeship Programme in United Kingdom. The candidate is provided with the opportunity to participate in activities of the Volunteering Matters – UK national charity organization, located in Ipswich. The traineeship is awarded to Gonxhe Kandri who is working in NGO Partnere per Femijet, IRIS Network partner in Albania. As a social worker with a degree in social science, obtained at the University of Tirana, she based her work experience on the projects which aim to promote well-being of the children and other vulnerable groups, such as young adults with disabilities or migrant women in Albania. She has more than seven years of experience in managing and monitoring child focused projects and activities, as well as in cooperation with institutions, especially in education, health and child protection sector. Kandri’s internship in the Volunteering Matters’ offices has started on 10th of August. After just two weeks of practice, it is visible that the Program has overcome her expectations. “This placement gives me the opportunity to understand different cultures and traditions, in the context of gender based violence (GBV) or domestic abuse. I am becoming familiar with different ways of addressing the needs of women from different countries and services which are provided for them here, in UK”, Kandri says. Since the first day of the Proffesional Training, Kandri is working with the WASSUP group. 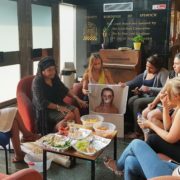 The WASSUP, which is abbreviations for “W.omen A.gainst S.exual exploitation and violence S.peak UP”, is the peer-led group of 17 women aged 17-25, which offers creative and innovative support and service provision for BME young women who have suffered from/ are exiting/ are at risk of child sexual exploitation or violence. “As part of my role, I’m doing a piece of research with the young and adult women who have suffered from GBV and until now I have done three interviews with them. I have five more interviews to do after which I will write a report. Also I have done a desk review about legal framework on GBV and studies related to this issue”, Kandri explains. She can anticipate the contribution of the internship to her future work in Albania. “In UK there are many different services which can be used to support victims of domestic violence and the existence of better understating of their needs is notable. All of the services are synchronized – something which is missing in Albania. We are still struggling in need of addressing domestic violence in a proper way” she said. The Volunteering Matters is the leading charity organization in UK, active in policy and practice. It is also an experienced NGO at European level – since 1990s it is member and the host of the Secretariat for Volonteurope, the key European volunteer network, based on promotion of volunteering, active citizenship and social justice. Gonxhe Kandri is holding a poster which is representing the victim of violence against woman, while other participants are commenting the picture. Professional Staff Traineeship Programme in organization of IRIS Network and SOLIDAR has officially started few weeks ago in the premises of Ligue de l’enseignement des Pyrénées atlantiques at the mountain center ‘Le Cardet à Gourette’ in France. Traineeship is involving participant in the organization and development of different activities, non-formal learning and animation with children and teenagers, among whom persons with intellectual disabilities. After they carefully reviewed numerous applications received, the IRIS Network in cooperation with SOLIDAR confirmed participation of Megi Kushi. Let us meet her and hear the impressions of the Training. Megi Kushi, coming from Albania, is young intern at the National Association Education for Life-SHKEJ, one of the IRIS Network member organizations. She has Master Degree in Organizational Psychology and, even though she is just 23 years old, has quite an experience in the field of social service provision and working with vulnerable groups gained through formal and non-formal education and trainings. Over the last few years she had been working with children in need – groups of Roma and Egyptian children in Albania, as well as with children with autism. Beside Albanian, she fluently speaks English and French. Within Professional Staff Training Programme, Kushi got the opportunity to improve skills related to her psychological work-profile: She has useful conversations with the children, helps them to feel comfortable and develop their interests in social interaction, based on healthy roots of self-esteem. “I learnt how efforts of the team are the key in organizing multidisciplinary areas that are focused on the well-being of children. I also noticed the importance of motivation as the staff priority. Cardet centre represents this perfectly”, said Kushi. Mountain Cardet centre, which is hosting ongoing Professional Training, hosts open school – discovery classes for children during holidays. 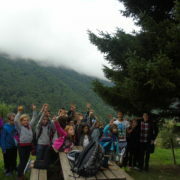 The school is providing different activities whose topics range from discovering the environment to sport and human activities, all connected to the mountain. “Children can enjoy the company of each other, explore themselves and the nature surrounding them and become engaged with life rules”, explained Kushi. In addition, Kushi mentioned that she learns a lot spontaneously, through the work routine, the discipline and the responsibility that the mission of Cardet is accomplishing with the children. She hopes of using most of skills and knowledge gained through this Training in her future work, after she gets back to Albania.